The expected visit occurred yesterday, January 19, at about 1:30 pm. Five SRD Officers showed up and posted a “Notice of Development” at the protest site, and gave copies of the notice to the protesters that were there. In effect, the notice closes a very large area of public land for an undetermined length of time. The closure area on the map even crosses Hwy 774 in a couple of places. 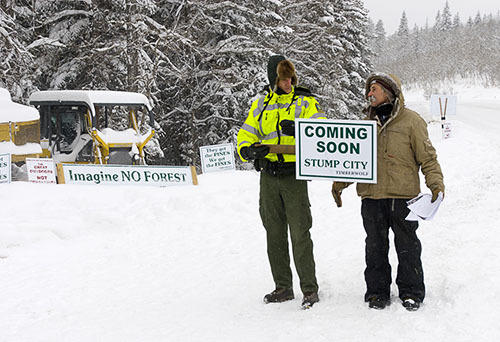 It appears that skiers driving to Castle Mountain Resort will be trespassing on public land! The notice seems simultaneously draconian and toothless at the same time. On one hand, a large area of public land is closed to everyone but SLS by the signature of a single SRD enforcement officer. On the other hand, the document doesn’t even indicate what government department is involved, doesn’t indicate the official capacity of the officer signing the document, and says that “…failure to immediately comply with this public notice may, without further notice, result in enforcement action under the Public Lands Act.” In other words, it appears protesters have been warned but not yet legally told to vacate the area. It also appears that SRD is suggesting that the random campsites, that were set up legally set up before the site was posted, are now considered in trespass even though the camps are still within the time limits allowed. The Pincher Creek Voice has coverage of yesterday’s events. We are consulting with our lawyers to decide on our next moves. In the meantime, as no one has been legally been told to leave, protesters will remain at the site. Your presence would be much appreciated! On Sunday, Jan 22, from 2–4 pm we’re having a rally to oppose the proposed logging. We’re contacting people now to come out to do some reading, recite some poetry, etc. We’ll have an open mike so we can hear from you. This may be our last best chance to keep the trees from falling by telling the government how much we’re opposed to this ill-advised logging plan. Please bring your family, friends, and signs with your messages for the government. This entry was posted on Friday, January 20th, 2012 at 9:48 am and is filed under Uncategorized. You can follow any responses to this entry through the RSS 2.0 feed. You can leave a response, or trackback from your own site.